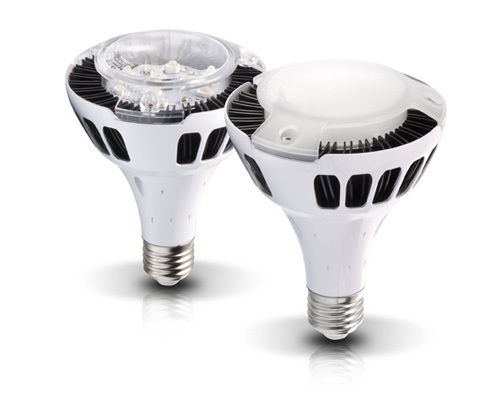 FZLED, the market-leading maker of LED lighting products, today revealed an impressive new range of 12-Watt LED Bulbs, each harnessing the power of seven long-lifetime high-power Cree LEDs.The PAR30-03 series offers both switch dimmable and TriAC dimmable options. It's a simple money-saving replacement for inefficient older lights in E26/E27 sockets. FZLED's PAR30-03 stands out from the crowd with universal compatibility and options for every customer. FZLED puts lighting control back into the hands of the customer. Users of switch dimmable models can easily select a desired brightness level by pressing the power on/off switch to step through the four options: 12%, 25%, 50%, or 100% of full light intensity. The TriAC dimmable version offers both low-voltage (AC 100-120V) and high-voltage (AC 220-240V) TriAC dimming. A non-dimmable version is also available. FZLED's PAR30-03 series is the clear lighting choice for all indoor applications, with its choice of both a warm white (FZL-PAR30-03-WW-12) and a cool white (FZL-PAR30-03-CW-12) version. The WW-12's warm 3000K illumination provides 750lm with a Color Rendering Index (CRI) of more than 80, while the CW-12 achieves 850lm with its bright 6000K beam. Building on FZLED's reputation for quality, these new LED bulbs give users a high-brightness lighting solution that's also energy-saving and environmentally-friendly. Thanks to their ultra-low-maintenance 50,000 hour Cree LEDS and durable, stylish aluminum and plastic housings, FZLED's latest LED bulbs are clearly built to outlast the competition, even as they conserve energy. With electrical efficiency greater than 80%, an impressive energy-to-light ratio, and a thermally-optimal design, FZLED is excited to bring consumers the best interior lighting solution available on the market today.